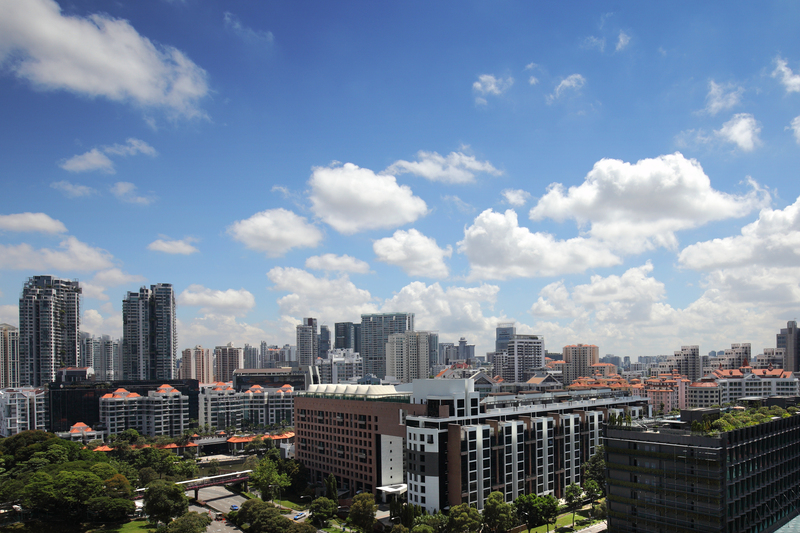 All eyes are on Singapore’s real estate prices as the market picks up, and investors start to get curious on how rents relate to them. One thing for certain is that real estate prices do not always have a direct relationship with rentals in Singapore. For instance, as property prices recover, the private rental market continues to remain weak. 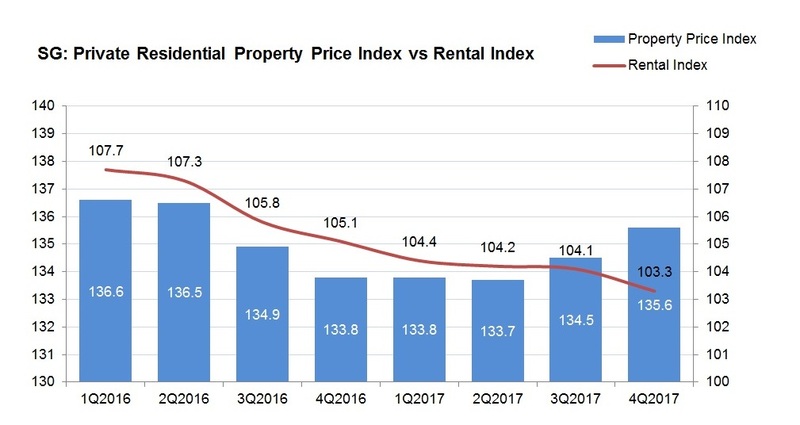 In this article, we seek to explore the relationship between property prices and rentals, and the reasons behind the decline in rental yield in recent years. Following the URA property price index’s (PPI) reversal from its downtrend in 3Q2017, private home prices has continued to gain momentum into 1Q2018. 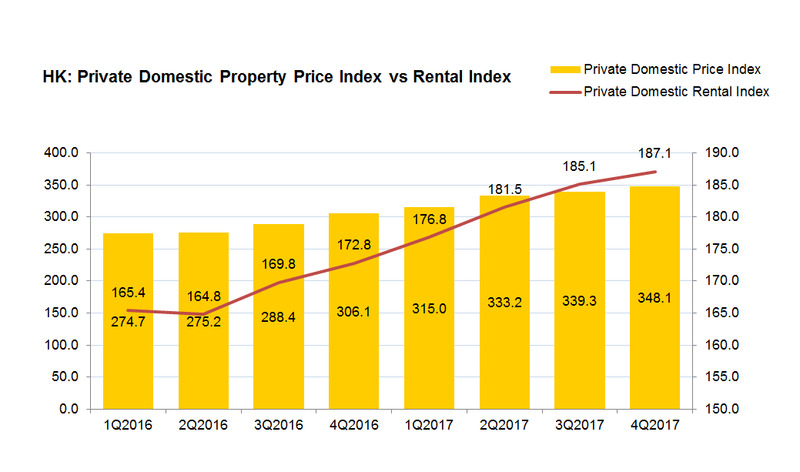 On the other hand, the private residential rental index fell 0.9% quarter-on-quarter (q-o-q) in 4Q2017, after a period of stabilisation in the previous quarter. One possible reason for this is because unlike cities like Hong Kong – widely regarded as another one of Asia’s most important financial centres – Singapore’s rental market is very much driven by foreign demand, given that over 80% of Singaporeans own a HDB flat. In comparison, Hong Kong’s rental market is increasingly being driven by a mix of local and PRC tenants, often senior staff from funds and brokerages. Locals are being driven into the leasing market by sky high prices and the limited availability of larger newly completed apartments on Hong Kong Island, Savills Hong Kong says in its recent Residential Leasing Briefing report. As of 2017, it is estimated that home ownership amongst Hong Kong’s population of 7.347 million stands only at about 49.20%, according to data by Trading Economics.